Figure 9-4. - Contaminated disposable bag with biohazard label. agents used in the Navy, water-based cleaning agents and waterless handwashing agents. Water-based cleaning agents include chlor- hexidine, iodophors, and alcohol among the active antimicrobial ingredients approved for handwashing. Products which use aqueous quaternary ammonium compounds, such as those containing dilute benzalkonium chloride, are not approved. 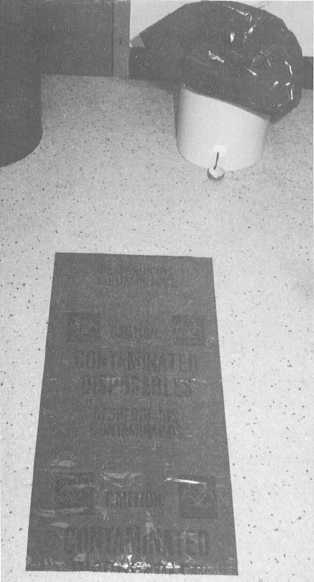 Outbreaks of nosocomial infection associated with the use of aqueous quaternary ammonium compounds have been documented. Two of the most common water-based cleaning agents are iodophors and chlorhexidine gluconate. IODOPHORS. - These are water soluble complexes of iodine with organic compounds that are effective against all gram-positive and gram-negative bacteria and viruses.